For over 40 years Craig Comen has been playing in the worlds Oceans. He competed for 11 years from 1979 to 1990 as a professional surfer, winning a number of championships and gaining notoriety. Later he became a coach of World Champion surfers and a judge of both amateurs and professionals alike. He began kayaking in 1997 and has paddled throughout the world, as well as guided for over 10 years on the Mendocino coast. He took over Lost Coast Kayaking after 8 years of service to them and since changed the name to Kayak Mendocino. He has a BS in Marine Science, having graduated from the intensive 2 year program at College of the Redwoods in Fort Bragg. His love for the Ocean, nature and safety will shine through on each tour taken to sea. 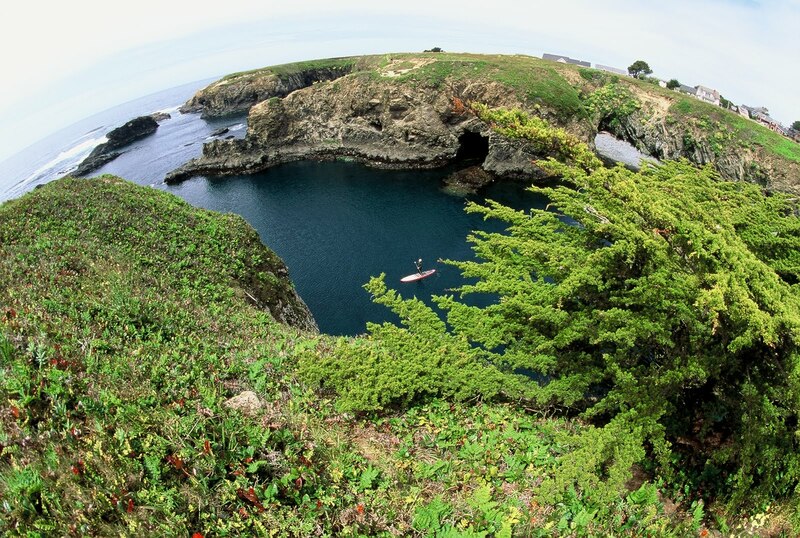 To give each customer a unique, safe and special experience on the water, by showing the magic that the Mendocino Coast has to offer.To open up others eyes, hearts and minds to the beauty that surrounds them and the role that nature plays in a healthy planet for all. By empowering each guest to realize their full potential and let them explore new areas of confidence and sense of adventure. Who: Our tours are for everyone, like it says. All ages,any or no experience. What to wear/bring: We provide all necessary gear. Wear light layering or shorts and a T shirt, and you are set. We have water shoes as well. Times: Best to have a reservation and call, but we do welcome those that just show up. Try to be there atleast a half hour before the scheduled tour. 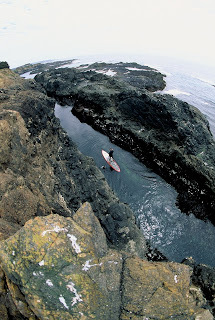 Conditions/Weather: It is so protected in Little River, that we can go out on days where it looks windy or rough elsewhere.We never go through breaking waves, and for 16 years we have made peoples trips to the Mendocino coast that much more incredible. 2015 kayaking season upon us!!! Yippeeee. Come on out and get inside some seacaves and fun with us in little river soon. 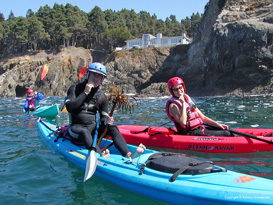 All the vest from kayak mendocino. We launched stand up paddle mendocino! Great stuff to share with you all! Goodness. Our growing family is so beautiful and loving the water. 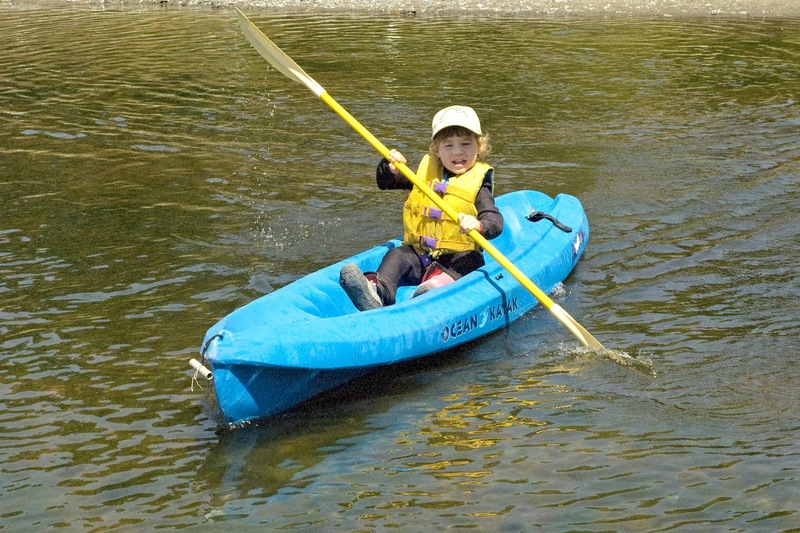 Check out Dylan paddling his own boat for the first time at age 3 1/2. Pretty amazing. I am so proud of him. Siena has been thru caves already a few times at 1 year old and Magda is loving the SUP paddles thru the caves as well. Guests have been treated to amazing trip thru the caves channels and rock gardens and I really think the best time of year is approaching. 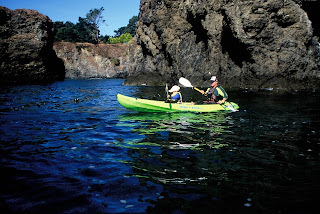 kayak Mendocino loves to share the magic of Little River headlands and the amazing offshore rock formations. We love where we are and what we do. 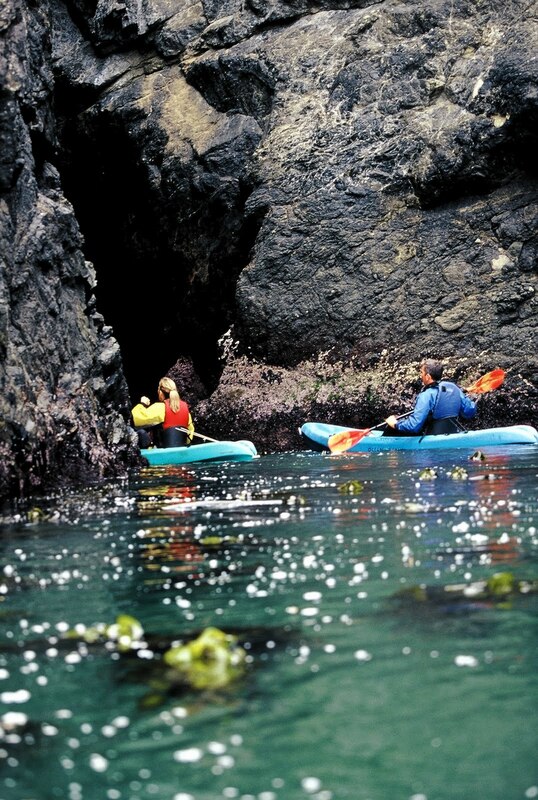 We have perfect locations, world class paddling. A waterspouts family ready to share with you. 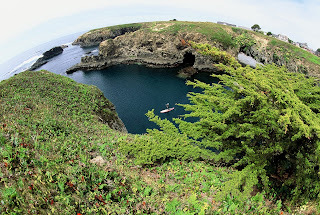 Mendocino stands for magic, so come check out what it offers!!!! We are down in Mexico paddling and staying warm. Hope to see you all soon. Looking forward to a great coming season , Craig, magda, Dylan , and Siena. Tours for any and every day!!!!!! 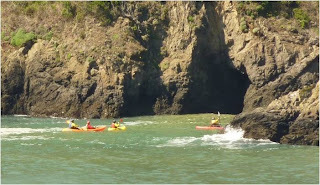 Finally some great conditions here at kayak Mendocino and we are having amazing tours. We have new photos to share of Stand up paddling and the big news is that our newest paddler Siena is due to be born any time now. I am so excited to meet her. Come see us again or give a call for your first magical Sea Cave Tour here in beautiful Mendocino..
We are off and paddling and it is as good as it gets. As many times as I have done this, it still gets better and better. 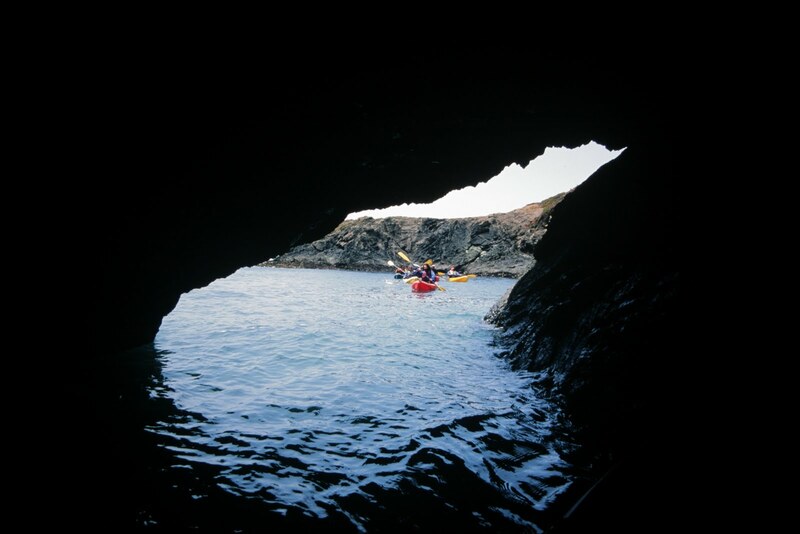 Each paddler brings a new outlook and smile to the caves and channels and I love the expressions as we enter the first tunnel. he weather has been a challenge, but we have forecast perfectly and not had to cancel any trips. Here are some images from my friend Chuck Graham on a recent visit up from Santa Barbara. Pretty awesome. Come experience it for yourself.We will be happy to cater to whatever need you have. Experienced or not, we have something for you. the Ocean has its way of doing that here. We are having such amazing tours and changing lives. i just had a couple who returned from Thailand and the comment I heard was, "this is one of the best things I have ever done." 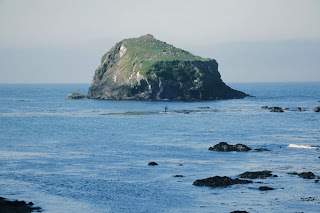 It is really rewarding to get this feedback and have such a rewarding thing to share with others.if you are even considering coming here to the Mendocino Coast, please call us for more info and any questions you may have. 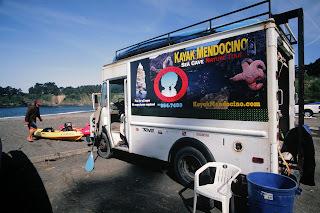 Kayak Mendocino will take the best care of you, in the best location and with now my 11th season of experience there. I look forward to sharing with you. We have been changing lives daily and having such great tours. It is spring and the colors are rich and waters alive. I am touched by the comments and feedback from all the recent paddlers and love what I do more every day. 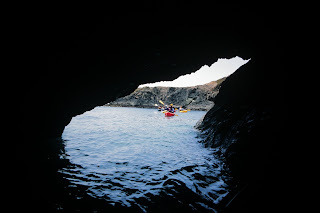 Please come check it out and experience the magic of the sea caves, coves and channels at Little River. We have been closed for a little while, and have been enjoying the warm weather in Chile where we paddled a remote lake and savored some of the fine wines and seafood of this country. This season we are excited to announce and bring all our new and returning customers the awesome sport of Stand Up paddling. These wide and stable boards allow for paddling either standing, prone, sitting, or kneeling. we will offer tours, lessons and rentals and cannot wait to share this with you. 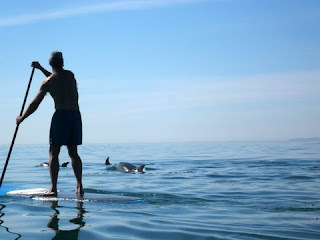 It is a great work out, and offers a unique perspective of being on the water. 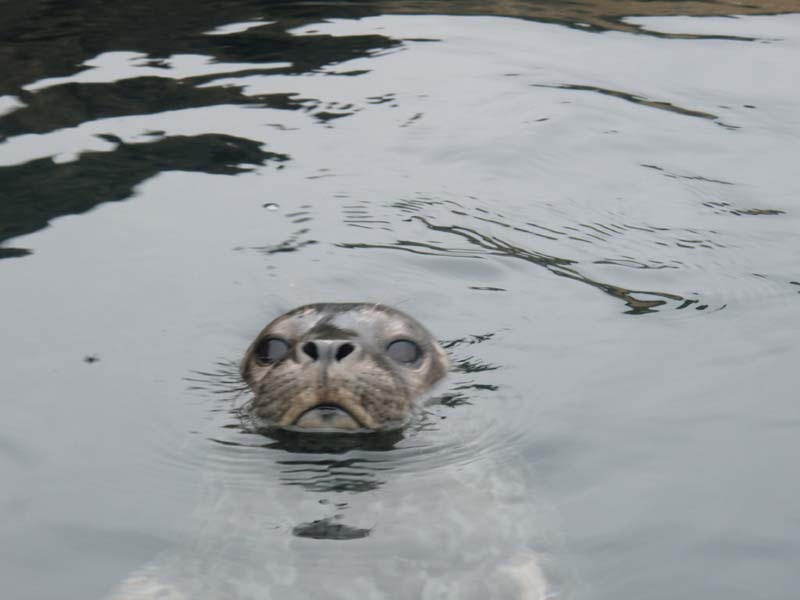 The caves, coves and channels of Little River will take on new appeal, and the seals will look on with amazement. Winter time here on the coast and we are going to close for january and February. 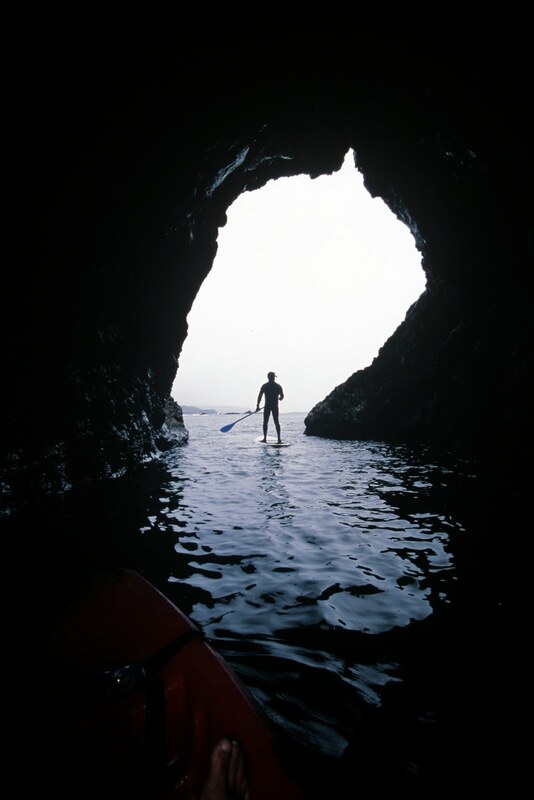 We have had some great trips, mostly just checking the sea caves out and letting the winter surf crash inside of them. I would like to thank everyone who came out with us this last year and all our great restaurants and Inns that sent paddlers our way. it is great to work with the likes of Little River Inn, Glendeven inn, Surf Motel, Beachcomber Motel and so many more to name a few. happy Holidays. This photo is of our pet fossilized whale, where the blowhole is. It is only 10 minutes max paddling from our launch at Little River Cove at Van Damme State Park. I think it is amazing and if in Australia wopuld be a national monument.Come check it out, when our Sea Cave Nature tours start up again in late february. 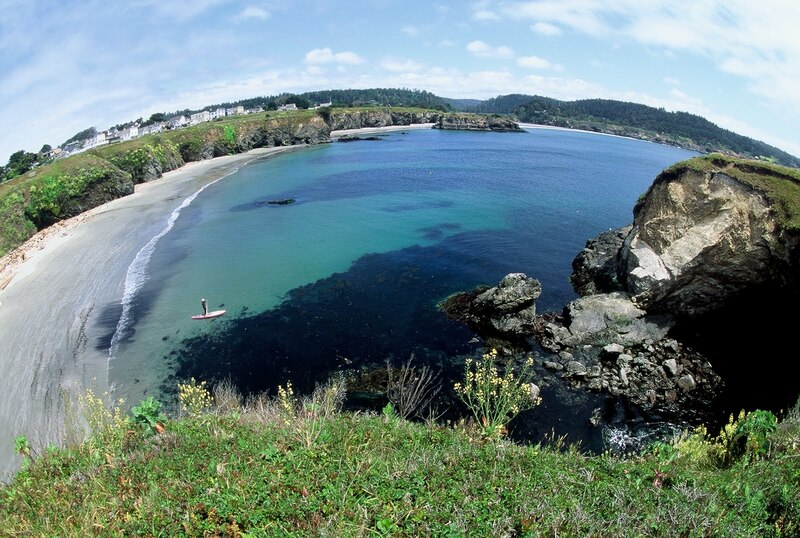 We look forward to greeeting all the visitors to the Mendocino/Fort Bragg coast and taking them on an amazing kayak trip. We are in the swing of the best time to paddle. 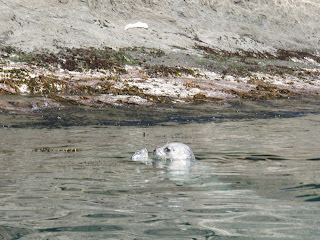 We are seeing pelican and sea lions feed everyday, hunting osprey, harbour seals and more. everyday is amazing. this location is so historical. 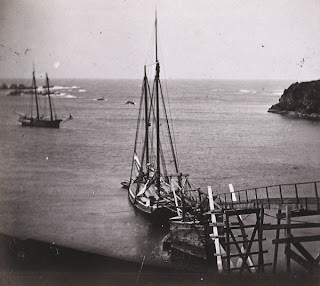 Check out this photo of the bay back in the logging days. We launch right here and go through this headland pictured. So cool. 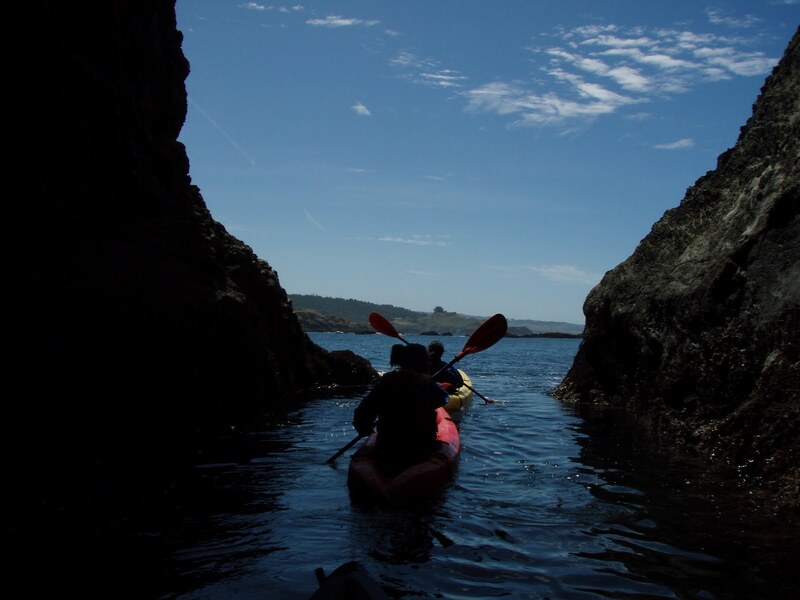 Kayak Mendocino is so happy to share this journey with everyone and we hope you can make it on on of our sea cave tours soon. Dylan my 7 month old son has been out twice now and loves it as well. Still a little time until he paddles, but I will be patient with him. 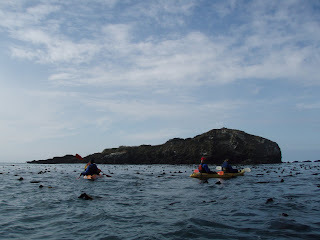 Give us a call, and come check out the magic as we glide over the seaweeds and giant kelp forest, and go back in time to see the geology and animal life as it was thousands of years ago. 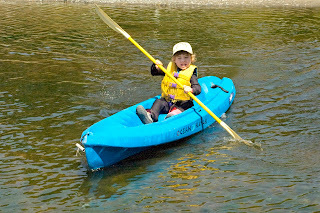 ok. our newest kayaker. Dylan has now been through the caves. this is how safe and protected and confident we are. amazing. only 6 months. 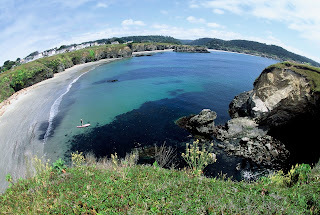 These headlands and bays are so cool here in Mendocino, and especially at Little River. I am ecstatic with life and you too can experience this.